Commodity prices are awfully volatile, which is why companies with the lowest debt levels are the safest investments to make. Commodity prices can be very volatile and change without notice. In the past year alone the key commodities of oil, natural gas, iron ore, silver, and gold have all dropped by double-digits at some point in the year. Looking out even farther all of these commodities are down by at least a third from the peak price over the past decade. Huge price drops like these can sink commodity stocks, especially those already weighted down by a lot of debt. However, despite this downward volatility commodity prices can go higher as well, minting a fortune for investors. The key is to be invested in a company that can make it through the low point of the cycle to cash in when prices rebound. Here are three safe commodity investments that are very likely to be there when a future uptick in commodity prices finally arrives. 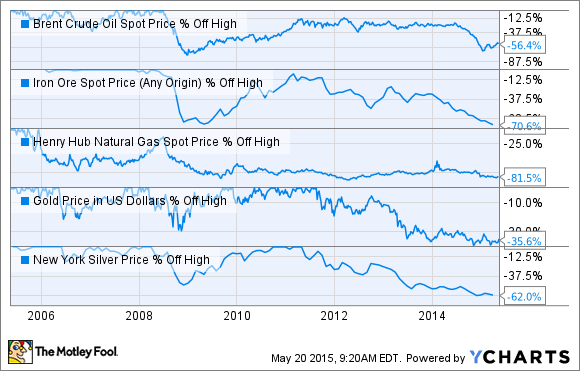 Oil prices are down more than 50% over the past year, which has taken natural gas prices down with it. This unexpected plunge caught many oil and gas producers off guard and some are teetering on the brink of bankruptcy as a result of taking on too much debt during the boom days. In fact, if there is one lesson to be learned from the crashing of oil and gas prices it's that debt is the enemy of oil companies. The downturn has also highlighted the importance of having a truly bulletproof balance sheet, which is what makes Big Oil behemoth ExxonMobil (NYSE:XOM) the safest way to invest in oil and gas. As the following slide shows, it has the best credit rating among other Big Oil companies, which also happens to be one of the truly elite credit ratings in the world. Source: ExxonMobil Corporation Investor Presentation. Not only is Exxon's balance sheet strength virtually unrivaled in the world, but the company is also a really good operator. Its returns on capital employed lead its peer group as does its earnings per barrel of oil equivalent. Further, the company also produces a ton of cash flow, which it uses to buy back stock, pay dividends, and invest in new production. Add it up and Exxon is by far the safest way to invest in oil and gas. The mining industry has its own giant in BHP Billiton (NYSE:BHP). The global resources company has a diversified portfolio of low-cost assets that's really unrivaled in scale and quality. It's also a superior performer with the best credit rating in the sector as noted on the slide below. Source: BHP Billiton Investor Presentation. As that slide points out BHP Billiton also has one of the best dividends in the group as it has consistently grown the payout despite the volatility in commodity prices. It has been able to do this because it keeps its leverage low and has low-cost assets that produce a lot of cash even at the bottom of the cycle. This combination enables the company to invest in the long-term when others in the industry are just focusing on surviving the downturn. Investors looking for safe exposure to silver and gold need to look no further than precious metal streaming company Silver Wheaton (NYSE:SLW). The company is different from a miner as it doesn't own the silver and gold mines, but instead invests in a new mine by paying an upfront fee with its developer to purchase a fixed percentage of future silver and gold production at a fixed price. Currently, the company has invested in 27 mines around the world, seven of which are still in development. These mines are owned by some of the strongest mining companies in the world and this diversification really helps spread out Silver Wheaton's risk. The company also boasts of a strong balance sheet and its low fixed costs lead to very strong margins and free cash flow. Some of that cash flow is used by Silver Wheaton to fund its dividend, with the rest reinvested in new mines. Investors looking for safe commodity investments need to seek out companies with strong balance sheets, which can withstand the volatility of commodity prices. That security, along with a focus on low-cost production, leads to solid cash flow generation, which is necessary for sustainable dividends. It's what makes ExxonMobil, BHP Billiton, and Silver Wheaton among the safest investments to make in the commodity space.